Newcastle-upon-Tyne suffers from a severe shortage of purpose built student accommodation (PBSA) and there are over 50,000 new students to the city annually . The two universities in Newcastle are the University of Northumbria and the Red Brick (Russell Group) University of Newcastle, both renowned for their exceptional reputation. Investors in UK Student Property typically receive bigger income gains than with other forms of Buy to Let property investing, much more income than from high street bank or building society accounts or even the best performing income bonds, with an national average NET return of around 7% per year. The number of students in higher education in the UK is booming and last year, for Britain’s 1.7 Million students, only 39000 purpose built bed spaces were developed, meaning that local supply for quality, desirable and secure student accommodation is by far outstripped by the growing demand for it. 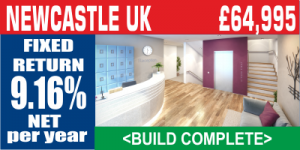 Why Invest in Newcastle Student Housing ? Location location location !